Welcome to the event description page for the 5-day Microservice Architect Certification Workshop. As explained below, optional Pearson VUE exam vouchers are available as part of this workshop registration. Regardless of whether you pursue the certification exams, by attending this workshop you will receive an official Certificate of Completion that will be mailed to you directly. This workshop includes the optional provisioning of Pearson VUE vouchers for the exams required for the Microservice Architect certification. The exams are available at Pearson VUE testing centers worldwide, as well as via Pearson VUE online proctoring (see www.pearsonvue.com/arcitura for details). 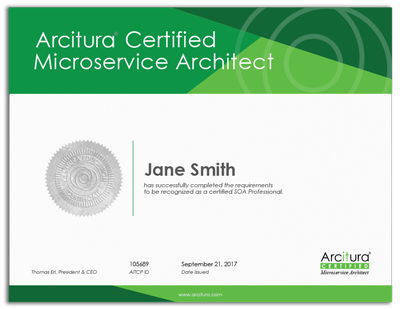 Upon receiving passing grades on the required exams, you will become a Certified Microservice Architect. An electronic certificate will be sent to you within a business week after passing the required exams and a printed certificate will be mailed to you thereafter. To view the outlines for each of the above listed courses, visit www.arcitura.com/soacp/courses. Scroll to the bottom of each course page to download the outline in PDF format. This workshop will be delivered on-site by a Certified Trainer at a venue in Istanbul, Turkey. Venue and catering details will be provided separately subsequent to registration. The registration fee for this workshop is $4,000 USD. Please use the REGISTER button below to submit your registration request. You will not be committed to this registration. You will first be provided with further information and you will have the opportunity to ask further questions. Your registration request will be processed within one business day. If you should have any questions, please contact info@arcitura.com.